Cogniscenti is an application development company established to design and deliver engaging solutions to the Sports Industry. 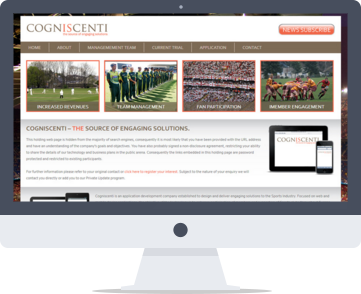 Cogniscenti is an application development company established to design and deliver engaging solutions to the Sports Industry. Focused on web and mobile device applications, they work with a portfolio of nationwide clients, from local sports teams to international sports organisations. As a web based product they required a focal point for all marketing efforts including a custom built log in area for existing customers to access information. The project was completed within 3 weeks due to a strict launch deadline and Cogniscenti are now set to expand into various other vertical markets.